Jagged rocks hooked into Steven Tucker’s overalls as he squeezed through a crack deep in a subterranean cave. Upon emerging at the other end, he saw he was in a chamber dripping with stalactites. Then his headlamp shone onto a bone. Then more bones, and half of a skull. It was the night of Sept. 13, 2013, and Tucker and his caving partner had just discovered the remains of what scientists would later determine to be a new member of the human family tree. The announcement of the discovery was made by scientists on Thursday, with Tucker looking on. Tucker was only trying to get out of fellow caver Rick Hunter’s way, inching to the side, on a different intended route when he stepped into the crack in the network of caves known as Rising Star. He’d heard of the crack before, but despite having been down this cave more than 20 times before, he had never noticed it, nor known of any other caver who had ventured down it. He shone his headlamp down the dark crevice, and couldn’t see where it ended. He knew of at least one other caver who also stared down the crack, and decided it was too dangerous. He began to lower himself, feet-first, into the narrow vertical opening. “It’s exciting to find something new,” Tucker, now 27, told The Associated Press on Thursday, trying to explain why he took the risk. Tucker, just wiry enough to fit, followed the crack deeper into the earth for nearly 13 yards (12 meters). “It’s 18 centimeters (7.1 inches) wide, with these jagged rocks, sticking into you from all sides. And suddenly at the bottom, it opens up into a large chamber with really stunning stalactites hanging from the ceiling,” Tucker said, hunching his shoulders and jutting his elbows out as he re-enacted the descent. 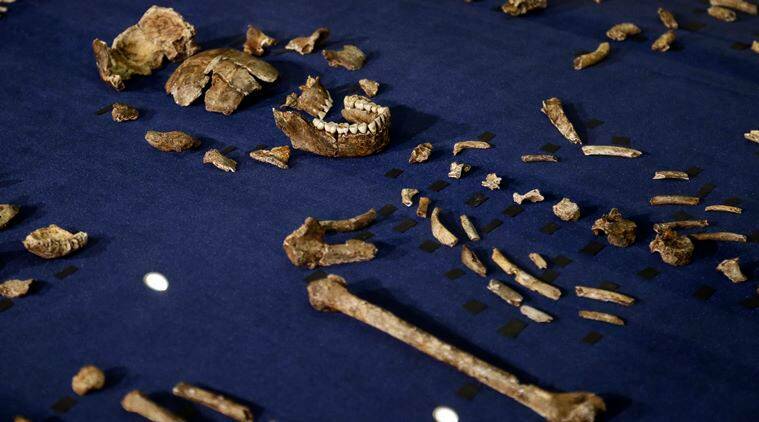 The 50,000-hectare (123,550-acre) area of hilly grasslands where the two were spelunking is recognized as the Cradle of Humankind, featuring a network of caves that has yielded nearly 40 percent of known hominid fossils, according to the University of the Witwatersrand in Johannesburg. But the bones in this particular chamber had apparently remained undiscovered until Tucker entered it. Inside what is now known as the Dinaledi chamber, Tucker’s headlamp illuminated pure white rock formations. Tucker and Hunter, who also braved the narrow chute, were excited to find new caving terrain. Then they saw the bones scattered on the chamber floor. An almost complete mandible told the cavers that they had found something almost human. Their camera battery had died so a week later they made their way through the cave again, and photographed their find. 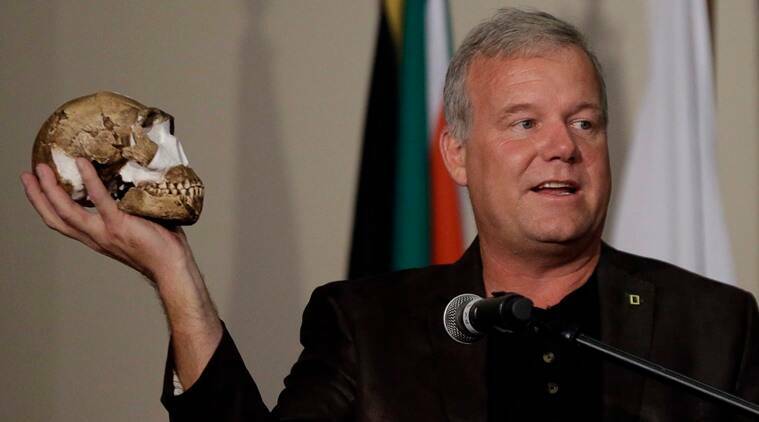 They sent the photos to geologist Pedro Boshoff, who alerted paleontologist Lee Berger, who went onto become the lead paleontologist on the discovery of Homo naledi. It was only when the cavers saw Berger’s excitement that they realized just how big their discovery was.